The NEW Ashaway Phantom Rackets are here! The Phantom X-Shadow and Phantom Helix are brand new for this season. The Phantom X-Shadow is the Pinnacle of the Phantom Range. 40Tonne Japanese Carbon Graphite meets High Modulus Quantum Carbon to make up this all-around frame. Perfect for attacking and defending, this racket really does have it all. A matt black frame with hints of Gold, Silver and Green really does make this racket look exquisite. Weighing in at 84g this racket is on the lighter side of the Phantom range. 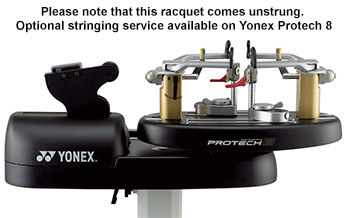 The Extra Slim profile really does aid this rackets velocity through the air creating tremendous racket head speed. For those that want to take their Ashaway Phantom experience to the next level…..this is the Racket for you!